This past weekend we had 27 students attend the Mars Hill Winter Retreat at Camp Baldwin. We had 18 attend from the Mobile Campus and 9 from the Fairhope campus. As I started planning the retreat and considering the topic we’d discuss for the weekend, I decided the fruit of the Spirit would be very beneficial for this group. 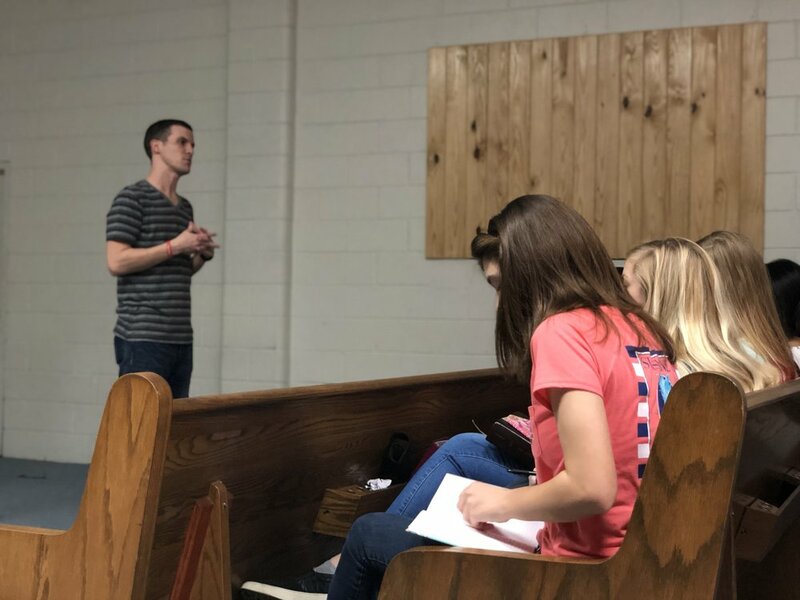 As a whole, this youth group is young in their faith and are still processing the gospel and how it influences their lifestyle, so, rather than some random topic, my goal was to cover a topic that built upon what we’ve already been teaching on Wednesdays that could speak to these specific students. Josh Taylor was the speaker for the weekend and he split up the topic over five sessions. Although there was a lot of content to cover, I thought he did a great job connecting with the students and giving practical examples of living out the fruit of the Spirit in our lives. After each teaching session, the students were split into a total of 4 discussion groups led by adult leaders from Mars Hill. The goal of the discussions was primarily to help the students better understand the topic at hand and how it impacts their lives, but I was also hoping these students would grow closer as a community and establish a connection with our leaders so that discipleship could continue to happen after the retreat. I intentionally grouped our Mobile and Fairhope youth separately in order for them to cultivate those relationships, and then we encouraged the two campuses to mingle amongst each other in between sessions and during free time. I’ve been following up with the leaders after the retreat to talk about how those discussions went, how we can follow up with the students, and how we can make these kinds of events better in the future. First all, I think something we should all celebrate is that we had 5 students accept Jesus Christ as their Savior this weekend! There were 2 from Mobile and 3 from Fairhope. I’m still so excited to see the 2 students from Mobile make this decision because I’ve been seeing them process what it means to be a Christian for a while now. To be honest, I almost started cheering when I saw one of them! We are following up with each student in the coming days. It was also amazing to see the students grow closer with the Lord. I had many conversations with the leaders about how they were seeing growth in these students. The leaders met individually with students after discussions and during free time. There are plenty of stories where students were repenting of sins and seeking to live out the fruit of the Spirit. It was also amazing to see students encouraging one another and praying for one another. I’ve also had some of the leaders talk to me about setting aside time each week in the future to continue to meet with these students individually. The students are seeking discipleship, and I’m so excited to see our volunteers answer the need willingly and with passion. Overall, I felt like this weekend was a success on many levels… I saw people accept Christ as their Savior; I saw students grow closer to Jesus and turn away from sins; I saw the group grow closer as a whole and encourage one another; and I saw them have a great time doing all these things. I couldn’t have done it without such a great supporting cast of volunteers and leaders and, most of all, the Spirit at work in all our lives.